iPhone calendar is an exceptionally useful feature for most users who are actually busy. An iPhone user can use this calender app to keep a track on precious information and make a more organized life. For instance, a calendar will help you to remember important appointments, agendas and other important dates. Some individuals heavily depend on Calendar app and for them, losing such data must be annoying. However, if you have lost your calendar data, that doesn’t mean that you have to give up on that especially when you have backups. It is possible to extract calendar from iPhone backup and the purpose of this article is to explain how to do it. Can I extract calendar from iPhone backups? In fact, if you try the official ways (either iTunes or iCloud backup), you will not be able to view and extract calendar. The only way to get them back via official way is to restore the whole backup, which will replace all your current data. However, that doesn’t mean that it is impossible to extract calendar from iPhone backup. To make it possible, you should seek the assistance of a powerful software that can retrieve any piece of data off iPhone backups. In the following sections, we will explain one of the best tools to extract calendar from your iPhone backups. 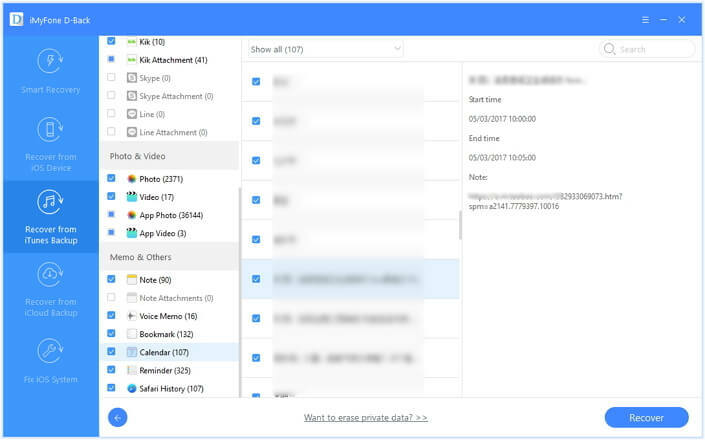 We have done some researches and ended up finding iMyFone D-Back to be the best option to extract calendar from iPhone backup. iMyFone D-Back is a prevailing option that comes with highly versatile features to impress iPhone users. Any iPhone user can rely on this tool when it comes to recovering data from backups. When you have D-Back, you inevitably become an expert in handling iOS devices efficiently. To extract calendar, you need follow only three steps and that explains the efficiency of this tool. 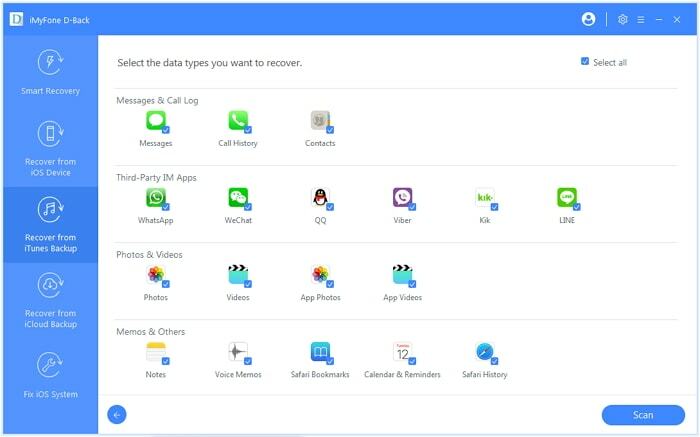 Here’s a quick look at the key features of iMyFone D-Back. 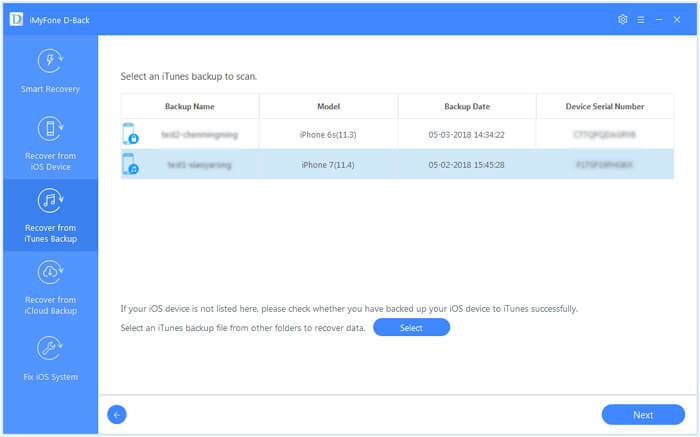 Extract data from iTunes or iCloud backups without restoring. 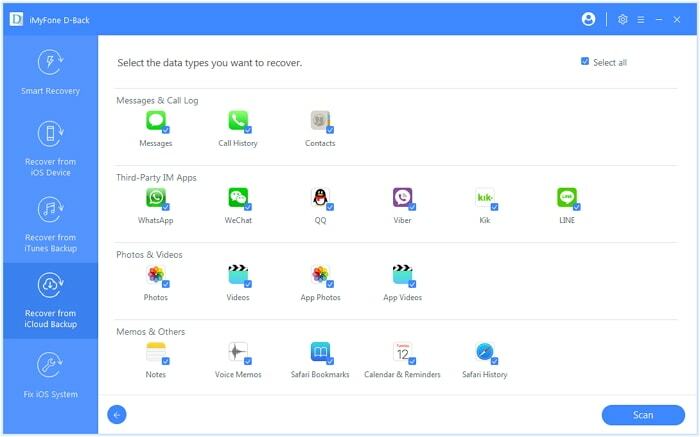 Extract deleted data from devices such as iPhone, iPad and iPod touch. It works perfectly with all the iOS devices and iOS versions including the latest ones. iTunes doesn’t allow you to view and extract calendar, so you can use D-Back to overcome its restriction. Well, here’s how to do it. 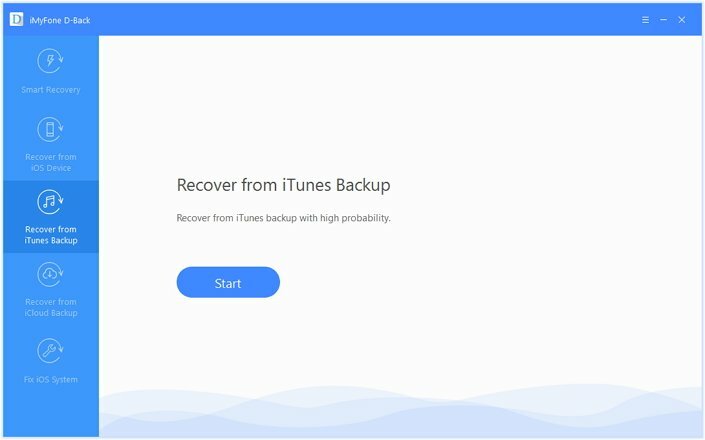 Step 1.To begin the process, you should click on the “Start” button that is located under “Recover from iTunes Backup” tab. Step 2.Then choose the iTunes backup which your calendar may be stored in. Then, click on the option “Next”. You will have to provide the password if your iTunes backup is encrypted. Step 3.Select the calendar data type and press “Scan” button and wait for the process to be completed. Step 4.You can preview the included calendar and choose what you need. Then, click on “Recover” option. Now the process is almost completed and you can define a path to save the recovered files and wait. If you have saved calendar to iCloud instead of iTunes, you can also use D-Back to perform the extraction with simple steps. Step 1.Press “Start” button placed with “Recover from iCloud Backup” section. 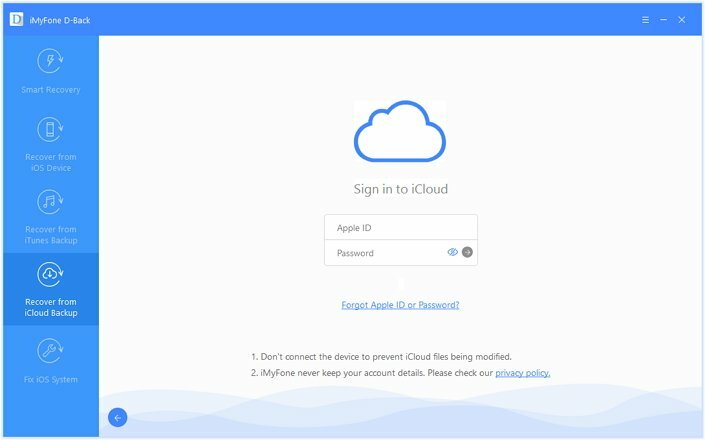 Use the relevant credentials and log into your iCloud account that is synced with the iOS device. Step 2.Choose the backup in which the calendar is stored and click “Next”. Step 3.Select the calendar data type and hit “Scan”. Step 4.Once the scan is completed, you can preview and choose what you need. Click on “Recover” and specify a location to store extracted files. 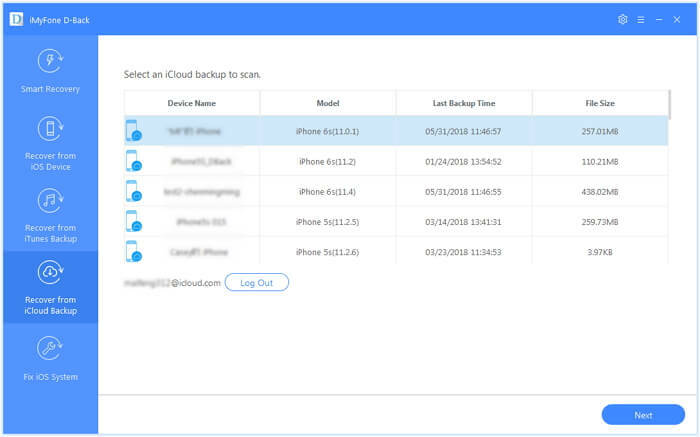 If you delete calendar from your iPhone, you can also use D-Back to help you even you do not have any backups. Step 1. Open iMyFone D-Back and go to “Recover from iOS Device” tab. Press “Start”. Connect the iOS device and click on “Next”. Step 2. Specify the calendar type you need in this situation to recover and click on “Scan”. Step 3. Once the scan is completed, you can see a list of recoverable files on screen. You can check the calendar files you intend to recover and press “Recover” button. If you want to view and extract your iPhone calendar from backups, you don’t need to feel helpless anymore. The methods we have revealed in this article can extract calendar from iPhone backup easily. We appreciate if you can leave a comment below and let us know your overall experiences. How to Add Google Calendar to iPhone & How to Export Them? How to Save Calendar from iPhone to iCloud?